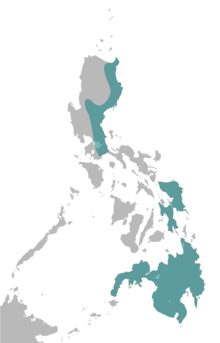 The Philippine eagle (Pithecophaga jefferyi), an aa kent aes the monkey-eatin eagle or great Philippine eagle, is an eagle o the faimily Accipitridae endemic tae forests in the Philippines. It haes broun an white-coloured plumage, an a shaggy crest, an generally measures 86 tae 102 cm (2.82 tae 3.35 ft) in lenth an wechts 4.7 tae 8.0 kg (10.4 tae 17.6 lb). It is considered the lairgest o the extant eagles in the warld in terms o lenth an weeng surface, wi Steller's sea eagle an the harpy eagle bein lairger in terms o wecht an bulk. Amang the rarest an maist powerful birds in the warld, it haes been declared the Philippine naitional bird. It is critically endangered, mainly due tae massive loss o habitat resultin frae deforestation in maist o its range. Killin a Philippine eagle is punishable unner Philippine law up tae 12 years in prison an hivy fines. Wikimedia Commons haes media relatit tae Pithecophaga jefferyi. Philippine Eagle Foundation. A foundation devoted tae saving the Philippine eagle. Original announcement of 1896 an detailed account from 1897 bi W. R. Ogilvie-Grant. ↑ BirdLife International (2016). "Pithecophaga Kimberly jefferyi". IUCN Reid Leet o Threatened Species. Version 2016.3. Internaitional Union for Conservation o Naitur. Retrieved 11 April 2017. ↑ Ferguson-Lees, J.; Christie, D. (2001). Raptors of the World. London: Christopher Helm. pp. 717–19. ISBN 0-7136-8026-1. This page wis last eeditit on 24 Februar 2019, at 02:11.